These cookies are one of my favorite for a quick breakfast snack or afternoon dessert. 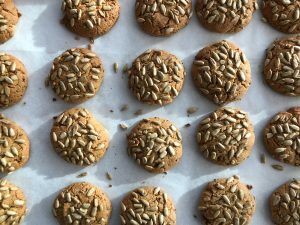 They are made with tahini, flaxseeds, honey and most of the ingredients are customizable so you can change it up if you want. The tahini can be sunflower seed, sesame seed, pumpkin seed or you can replace it with a nut butter of choice (the runnier ones work better). If you are a vegan who doesn’t eat honey you can replace it with maple or agave syrup. I used a mixture of AP flour with whole wheat, but I’ve also done it with 100% whole wheat and other times with all AP flour, it works great both ways. The flaxseeds aren’t absolutely necessary, but they add extra fiber and flavor. And last but not least, you can top them with whatever you like, I used sunflower seeds, but you can use sesame seeds, pumpkin seeds or crushed nuts. **I use a combination of all-purpose flour and whole wheat (1 cup all-purpose and 1/2 cup whole wheat), you can also do all whole wheat or all all-purpose if you like. ***You can use sesame seeds for rolling, pumpkin seeds, or crushed up nuts. Preheat oven to 350ºF (180ºC) without fan/ventilation. Line a baking tray with parchment paper. Add your sunflower seeds to a shallow bowl (these will be the topping for the cookies). In a large bowl combine the honey and tahini (if your honey is thick, melt it in the microwave for a bit until it’s runny). Mix these until smooth with a spatula. Add in your vanilla, salt, baking soda, and mix until smooth. Finally add in your flour and flaxseeds, fold that with your spatula until the dough completely comes together in a ball (I usually bring it together with my hands at the end). Roll your dough into balls about the size of a ping pong ball (you can also use a cookie scoop). Flatten them out a bit then dip one side in the sunflower seeds, pressing a little to get them to stick. Line them up on your baking tray, giving them even spacing (I do a 5x4 row). You should get about 20 cookies. Bake for 14-16 minutes or until they are golden brown all over. Let them cool for 5 minutes on the tray, then enjoy. These can be stored in an airtight container for up to a week at room temperature.